Even though this recipe only uses a half stick of butter, the banana bread smells and tastes amazingly buttery. Chunks of high quality dark chocolate and whole pecan halves make this an indulgent treat with afternoon tea. 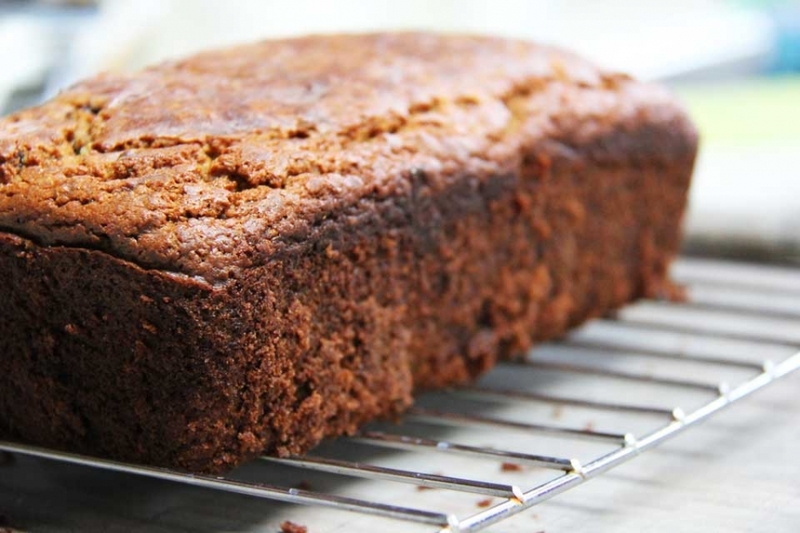 This banana bread has a wonderful, tender texture and is not overly sweet. It’s better the day after baking, which makes it an excellent choice for giving as a gift. The loaf form is a better choice for giving as a gift, and large muffins transport better than slices, which make them a good choice for packing in your family’s lunch boxes. Use light colored metal baking tins, since dark baking pans will over brown this bread, and glass baking pans aren’t good for baking breads. Preheat oven to 350º F. Grease muffin tins or 8″ loaf pan well with coconut oil. You”ll mix the wet ingredients in one bowl, sift dry ingredients into another bowl, and then add the dry to the wet slowly while blending batter with an electric mixer. Sift dry ingredients together. Add slowly to wet ingredients with mixer running, until ingredients are just blended. Do not over mix quick breads. It results in a tough, dense finished product. Fold in chocolate chunks and pecans with a rubber spatula. Pour batter into large muffin tins or loaf pan and bake in the center rack for 25-35 minutes (test by inserting a slender knife at 25 minutes). Don’t over bake! Take banana bread out as soon as the knife comes out clean. Let sit in pan for 5 minutes and then carefully turn out onto cooling rack. You’ll be tempted to get into this bread right away, but it tastes much better after it is completely cooled and the flavors are allowed to settle. In fact, it’s much better the next day. So be patient, wrap the loaf or muffins once completely cooled and enjoy the next day. Your patience will be the difference between a good banana bread and a fabulous one. Don’t even think about using regular yogurt (not Greek) or low fat yogurt. Make sure you are using plain yogurt. The ingredient list should list only organic milk and cultures…no sweeteners, thickeners or flavors of any kind. I’ve also made this using organic whole fat sour cream with excellent results. I say 1/4 cup, but you can add more depending on the texture you prefer. I sometimes use a half cup. You can substitute the coconut oil with butter, but it is really much better with the coconut oil. Don’t like pecans? Use walnuts. Or don’t use nuts. It’s fine to omit the nuts. I prefer vanilla paste, which contains vanilla bean seeds. If you can’t get paste, an equal amount of high quality vanilla extract will work. I think using chunks of really good quality dark chocolate is much better than chocolate chips. Just get a good bar of Green & Black organic dark chocolate and chop it into rough chunks with a big knife. Milk chocolate chips are too sweet. If you are using fresh bananas, they need to be a little over ripe. I use frozen bananas. They are not very ripe, but because they have been frozen, they bake up the same as very ripe fresh bananas. I freeze them whole, with the skins on. I peel them when they are still frozen (which is a lot easier than trying to peel them when they are defrosted and mushy). I cut the peeled frozen bananas into chunks and leave at room temperature to thaw, which doesn’t take long. They are very soft and mushy when thawed, and don’t need to be mashed before incorporating into the batter. To be honest, I never measure the bananas, I just use two regular sized frozen bananas. Once I was short a bit of flour, and threw in 1/4 cup of coconut flour to cover it. It turned out really well, in fact, I like it better than using just wheat flour. Though don’t go overboard with coconut flour, as it can ruin the texture of your baked goods. Please note that I am talking about actual coconut flour, not flaked coconut. If you are in the mood, add a handful of chopped up Bari dates (pitted, of course). You can substitute date sugar for regular sugar, but not all of it. I’d stick to 1-3 tablespoons of date sugar. I made this recipe once with gluten free flour from Maninis. The baking time was considerably longer, around 55 minutes.